Among the most important cards in all of collecting. 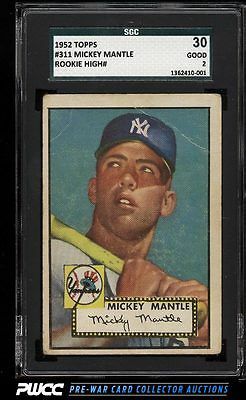 The offered '52 Mantle boasts outstanding color and focus for the technical assessment. Displays attractive cream borders with well formed corners for the grade. A typical centering shift, a couple of heavy surface wrinkles and some surface scratching on the reverse downgrade. An iconic and important card which is deserving of attention. One of nearly 17,000 cards, lots, and sets up for bid in our 8th Auction of 2016. Click on the link above to view the other PWCC auction lots.